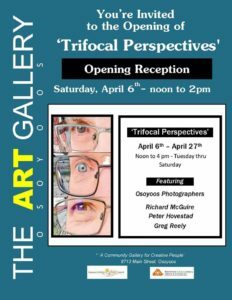 You're invited to the opening and exhibition of Trifocals photography exhibition showcasing the work of three local residents Richard McGuire, Peter Hovistad, and Open weekly Tuesday-Saturday from 12-4pm. Logan is a Folk, Roots, Singer Storyteller from Onanole MB. Madeline is a contemporary folk singer and songwriter from Winnipeg MB. 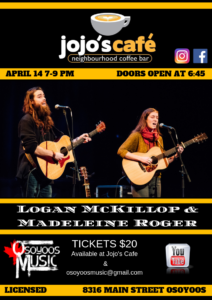 Tickets are available at the cafe and osoyoosmusic@gmail.com via email money transfer.